Jonan Garrison is the lead engineer aboard a spaceship. He’s a workaholic that never leaves his post. After two years of nonstop work, he plans to attend the largest technology convention in the universe. Eli is racing against time. He created a weapon that could destroy planets. His boss plans to unleash the power at the technology convention. Determined to stop the slaughter, Eli sets out to destroy the weapon. He didn’t count on meeting his mate along the way. 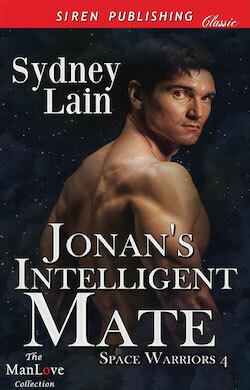 The instant attraction sizzles between Jonan and Eli, but Jonan can’t figure Eli out. He’s a puzzle that’s missing a few pieces. When he follows Eli, he finds him breaking into a secure area and placing bombs. Torn between justice and helping his mate, Jonan needs to make a choice. With men following them and determined to capture Eli, they run. Will Jonan forgive Eli for his lies? Can Eli learn to trust Jonan with the complete truth?